one of my favorite friends just had a special birthday celebration this past weekend and i got a little crafty to make it festive. 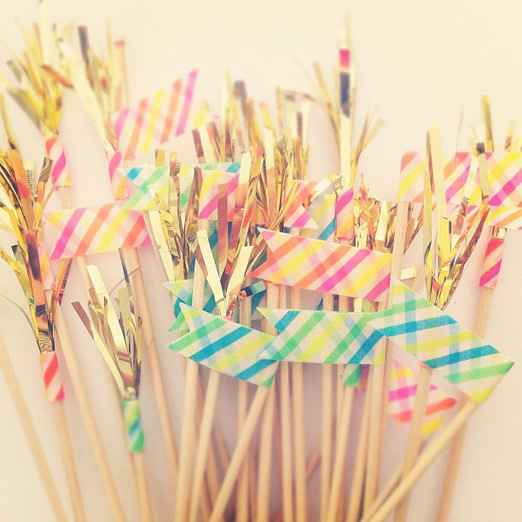 one of my favories were these cute little drink stirrers, they made every drink feel like a party! they were simple to put together and only required a few things- a 1/8″ dowel cut into 7-8″ sticks, washi tape, and gold foil. *heads up- washi tape will work on it’s own for the flags but for the confetti sticks i had to bust out the glue gun to keep them together. 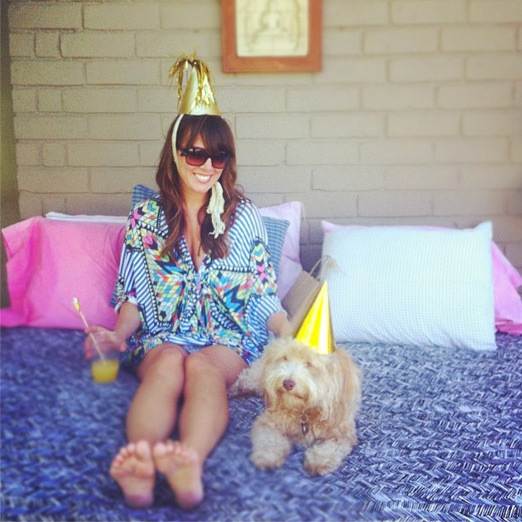 here’s the birthday girl, margaux, and her sweet dog henry (who it turns out LOVES party hats!). they’re cute as can be, right?! happy happy margs! Wow these are super cool … I love them ! What a great idea! That dog is simply "cudde-able". Also envious that she can get him to keep his party hat on. My pup Odin is more of a take of all your clothes kind of party goer. Love this! And LOVE her dress!! Any idea where it's from? Thank you! I looked and looked and can't find a pattern I like quite as much as this one – but I'll be on the lookout! aww, thank you for making my birthday so special (and cute!). love you! !